A preview of tonight's Toronto/Boston Game One. Five years ago, in Game Seven of first round of the National Hockey League's playoffs, the Boston Bruins came back from a 4-1 deficit in the third period and defeated the Toronto Maple Leafs 5-4 in overtime. The Leafs are probably going to try to get revenge this time around. The Leafs finished the regular season this year with a 49-26-7 record and was third in the Atlantic Division. 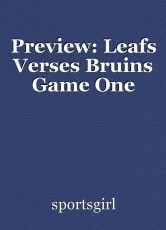 The good news for the Leafs is the Bruins are 1-3-1 in their last five games. The Leafs also have a goalie, (Frederik Andersen), who won 38 games this season. This page was created in 0.4441 seconds.